My thanks to Goldspot Pens for sending me the Lamy Nexx for review. 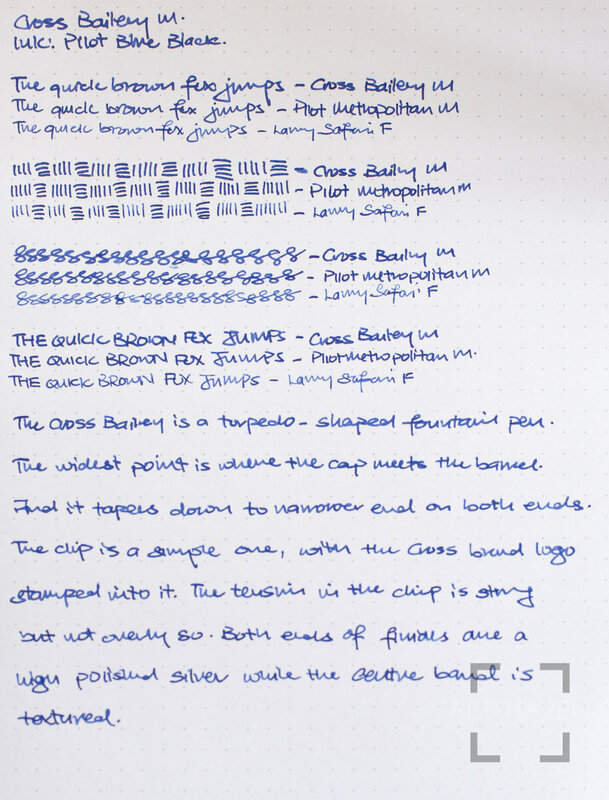 This is my first experience using and reviewing a Cross fountain pen. Cross is one of those brands that has been around a long time and is more known for its more stately and business like pens. And the Cross Bailey doesn’t disappoint. It comes in a variety of colours and it even has a ballpoint version if you are looking for a matched set. This is where it falls down. The packaging is a simple clear plastic box. It looks cheap and it is probably cheap to manufacture too. I know this is an entry level Cross fountain pen but even entry level pens from other brands that costs less than the Cross Bailey is able to provide a better presentation than this plastic box. For a pen I expect to be purchased as a corporate gift, this packaging just doesn’t do the job. Just saying. The Cross Bailey looks like it is a fountain pen very much made for corporate gifts or in a the pocket of a business shirt. I got the red lacquer version. It is a dark maroon with silver accents. The weight is comfortable in my hand. It can be a little back heavy because of the metal housing. The cap opens with a firm tug and closes with a satisfying click. It can also be posted as well. The grip section is a smooth black lacquered texture, similar to the barrel. 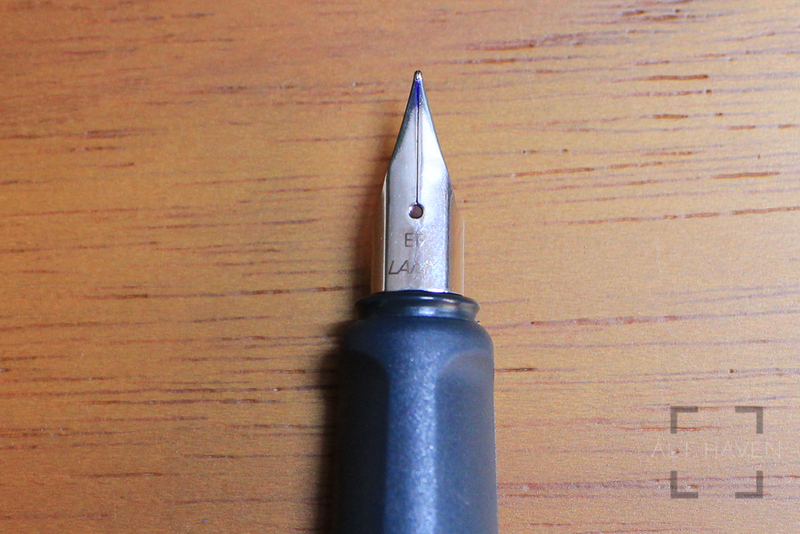 It tapers to a narrower end towards the nib and has a metal lip. There is no step between the barrel and the grip, making the section longer than usual if you have larger hands. The Cross Bailey takes a cartridge and converter system. Though technically it sort of takes an international cartridge and converter do not be fooled, it doesn’t. Cross have their own converters and cartridges so be sure you have the right ones. The Cross Bailey comes only in a stainless steel medium nib. It writes very well. More so than I am really used to, or am able to handle, especially if I filled it with a very wet ink. Lefties do take note of this. Also, I am not sure if I got a lemon. The Cross Bailey scratches across the paper when I write at my usual angle. It writes smoothly when I correct my angle to a lower one. The difference in angle isn’t too great but unnatural for my hand. When I look at the nib through the loupe the tipping off centre. I think this contributed to the problem as well. The Cross Bailey is a serviceable fountain pen. At the price point, it seemed aimed at students but the design looked like it was meant for the working adult. As an entry level fountain pen for someone trying out the hobby, the Cross Bailey does the job well. The odd tipping issues I found in my pen could well be a one off problem. I can’t really say one way or another since I have limited experience with Cross fountain pen. 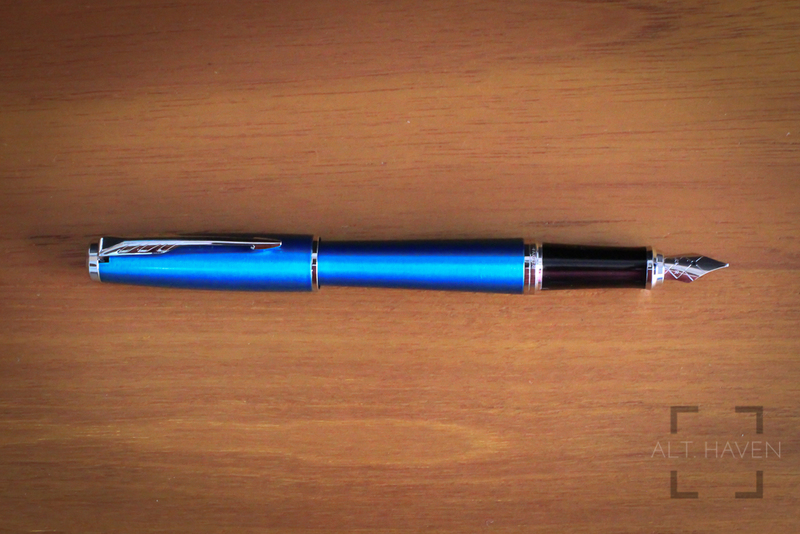 Intro: My thanks to Executive Pens Direct for sending me the Parker Urban fountain pen for review. This isn’t the first Parker fountain pen that I’ve reviewed but this is my first experience with a Parker pen that isn’t of the entry level tier. Parker is a brand known for its long history in fountain pen making. 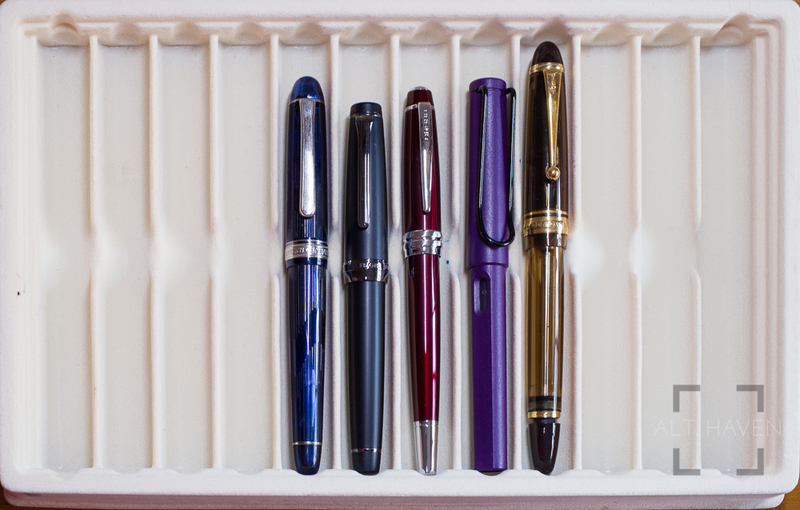 Its vintage fountain pens are much sought after and many still perform well today. Now how does a modern Parker fountain pen fare? 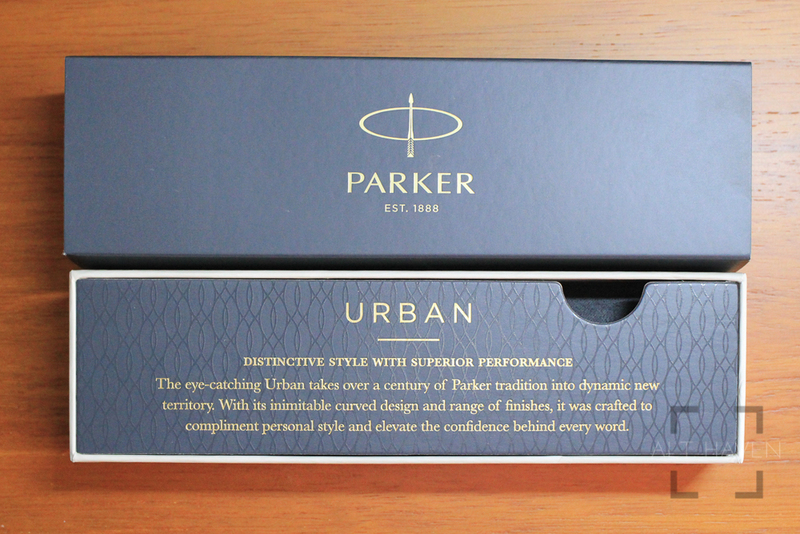 The Parker Urban comes in a very stately box. It starts with a grey sleeve with the Parker logo on it. Its texture feels nice to the touch. That slides out to reveal a nicely printed card, underneath that is the fountain pen securely nestled on a bed of velvet like material. If I were to judge a pen by its packaging, I have to say I am very impressed. The Parker Urban from its appearance looks sleek and distinguished, very much inline with my impression of the brand. It has a metal body and a stainless steel nib. The fountain pen is vaguely torpedo shaped. The widest point is where the cap meets the barrel. There is a slow taper to a narrower point towards both ends. The balance of the pen is slightly back heavy because of its metal housing. It would probably work better for people with larger hands than mine. 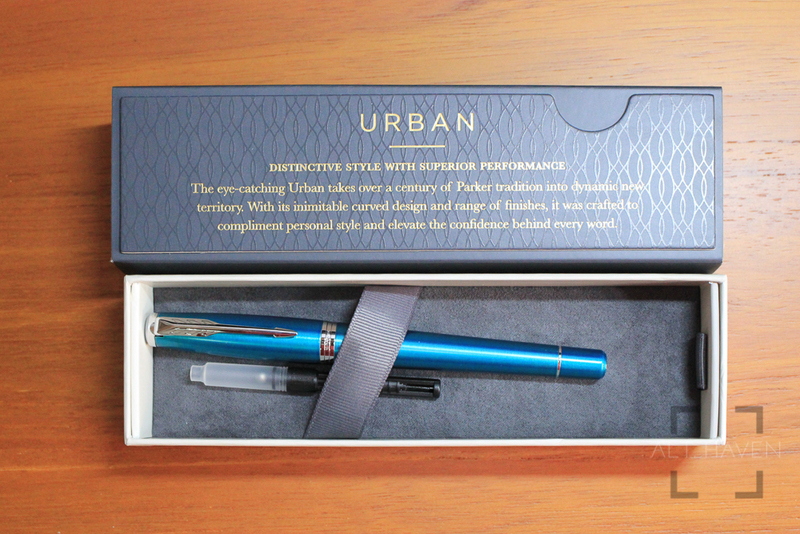 My Parker Urban is the Vibrant Blue model but it looks turquoise when you hold it in your hand. However, it photographs as a blue colour. It’s really odd that it is this way. So bear that in mind when you look at the photographs. The strong turquoise colour is accented with chrome trims. Both ends of the pen has a plain polished chrome tips. The clip has Parker’s traditional arrow shape. It has a good tension to keep the pen secure. The cap pulls open easily and closes with a very satisfying click. Plus, the cap can be posted if you so desire. The grip section is a plain black plastic with a metal lip. It is long enough to fit most hand sizes. There is a slight step between the barrel and the grip but it doesn’t get in the way when I write. The Parker Urban fountain pen is a cartridge and converter system which makes it easy to fill and clean. And a push converter comes provided with the pen. 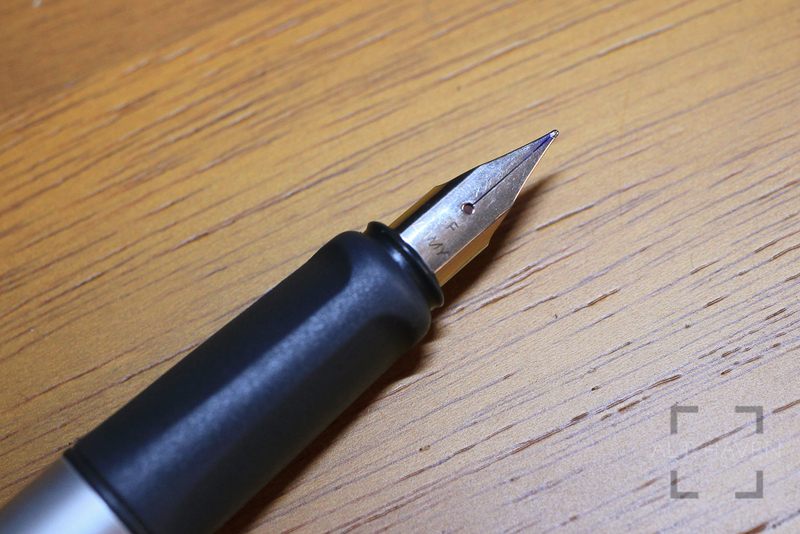 The stainless steel nib looks under-sized especially when compared to the body of the pen. I keep thinking there is more nib where I can’t see. I’d prefer if this is a larger nib just to make the entire design of the pen look more balanced. Still, regardless of the size it writes nice and smooth. I was sent a medium nib and it is still fairly useable for me. Now, comes the problematic part of the Parker Urban. At least for my particular pen. The nib dries up, very, very, very easily. It hard starts without fail every single time. I don’t believe the ink capacity of the Parker converter is a lot less than the other brands of converter I’ve used and even taking into consideration wider nib size, I run through ink on this Parker Urban way faster than usual. Normally, I can fill a pen and use it for an entire month and still have ink left over. With the Parker Urban, I run out in two - three weeks. Putting aside the faster than usual use of ink, the hard start issue is just not acceptable. I am quite sure I got a lemon because from my googling I’ve not found a review where they had the same problem. As long as you have purchased your Parker Urban from a reputable store. I’m sure you will be able to return the pen and get a replacement easily. The Parker Urban fits the corporate world with ease. When it writes, it performs well. However the hard starting issue makes me wary to recommend it. Everyone knowns the Lamy Safari. One look at the Safari there is no mistaking it for any other pen. The Lamy Nexx is a lesser known entry level fountain pen for Lamy. It’s priced lower than the Lamy Safari so this is a good competitor against the Safari. 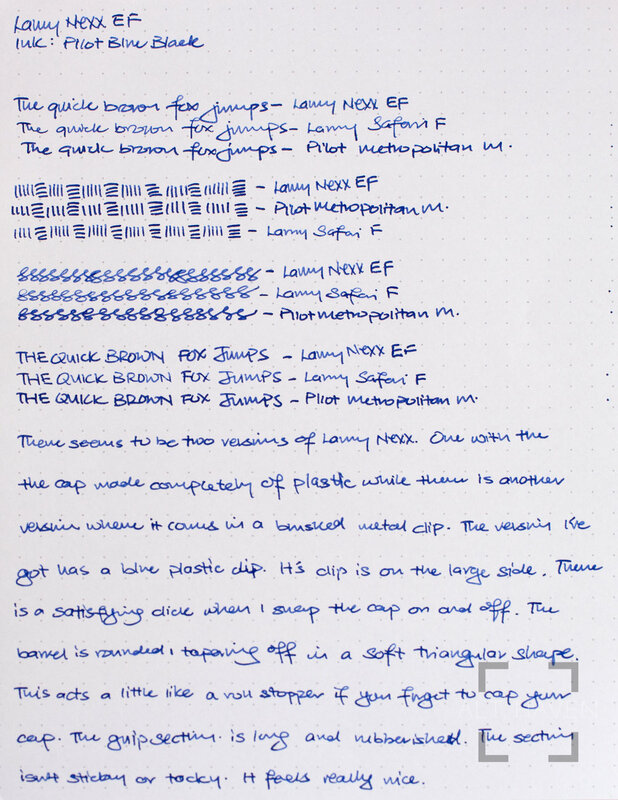 The Lamy Nexx comes in a variety of different colours and is available in EF, F, M stainless steel nibs right off the shelf. However you can purchase extra nibs in the 14K variety as well as B and stub nibs of different width. 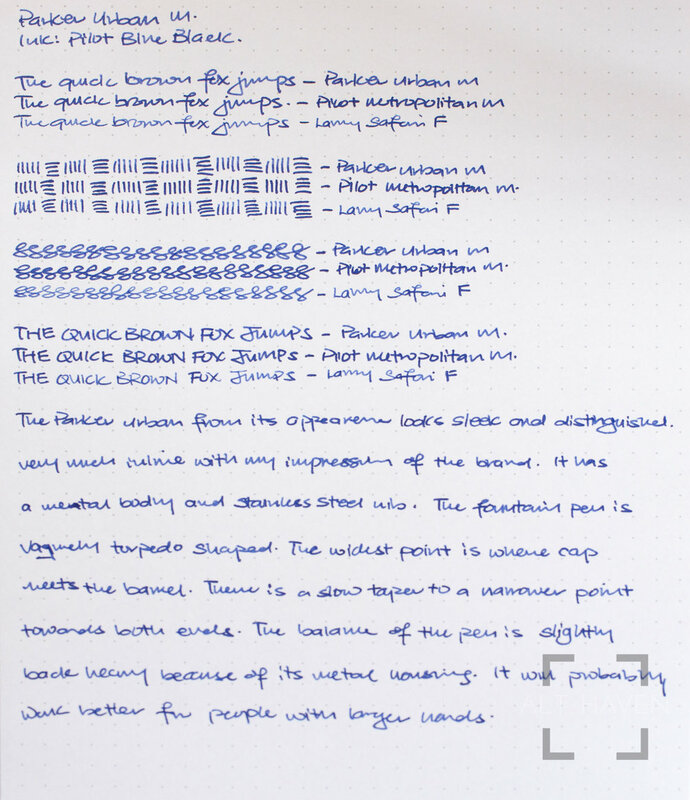 This is the versatility of the Lamy fountain pens. 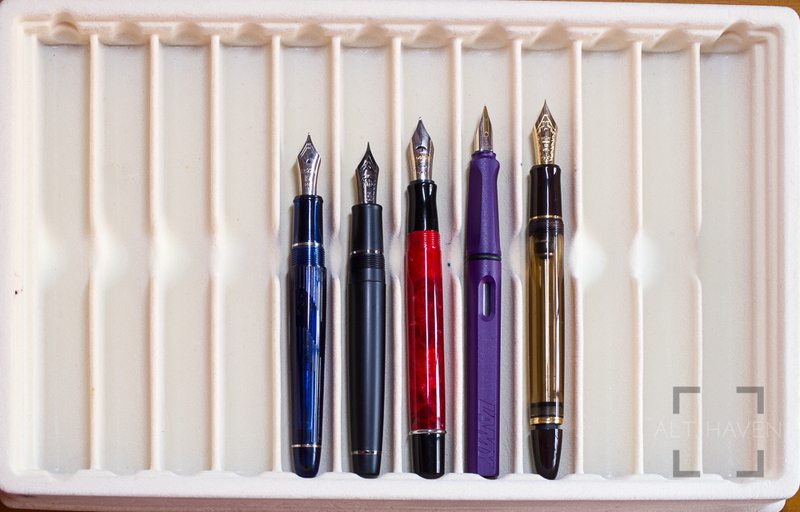 Most of them use the same nibs so that makes nib swapping very easy. 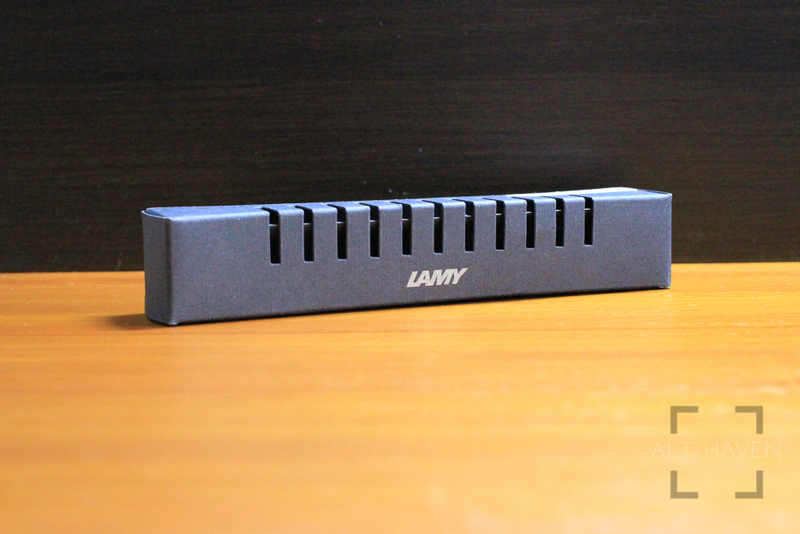 If you’re familiar with the Lamy Safari packaging, the Lamy Nexx comes in the exact same box. It’s the dark grey cardboard box that’s compact and small. I really enjoy packaging that didn’t take up so much more space when compared to the pen itself. The Lamy Nexx seems to have two versions. One with the cap completely made of plastic while there is another version where there is a brushed metal clip. The version I got has a blue plastic cap. It’s clip is on the large side. There is a satisfying click when I snap the cap on and off. The barrel is rounded, tapering off in a soft triangular shape. This acts a little like a roll stopper if you forgot to cap your pen. The grip section is long and rubberised. The rubberised section isn’t sticky or tacky. It feels really nice and helps me maintain my grip on this lightweight fountain pen. The grip is a moulded one. 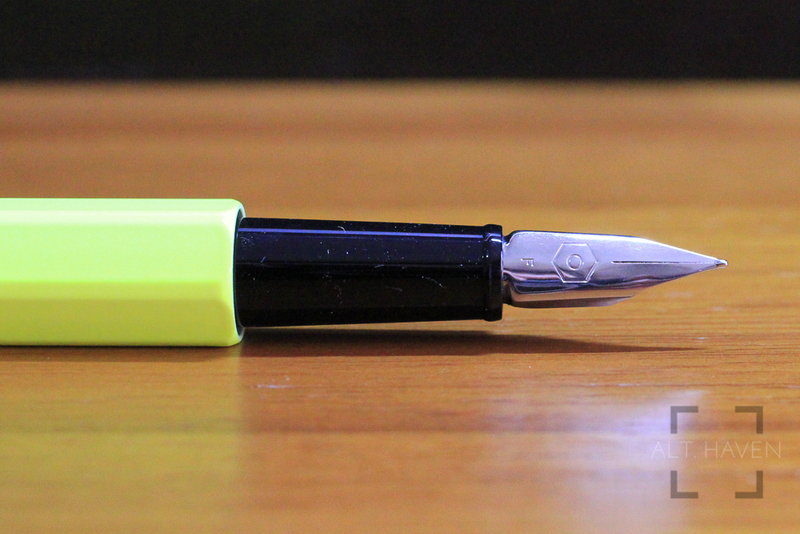 It has the triangular shape but it’s a lot more rounded when compared to a Lamy Safari’s grip. For anyone who has trouble using the Lamy Safari’s grip can give the Lamy Nexx’s grip a try. The Lamy Nexx is a cartridge converter fountain pen. It takes the regular Lamy cartridges and their Z-24 converter Z 24. The stainless steel EF nib it came with is writes nicely. It is not the butter smooth writing experience but I am not expecting it. This is an EF nib, it writes with a little bit of feedback. It is not unpleasant, in fact I quite enjoy this aspect of the nib. 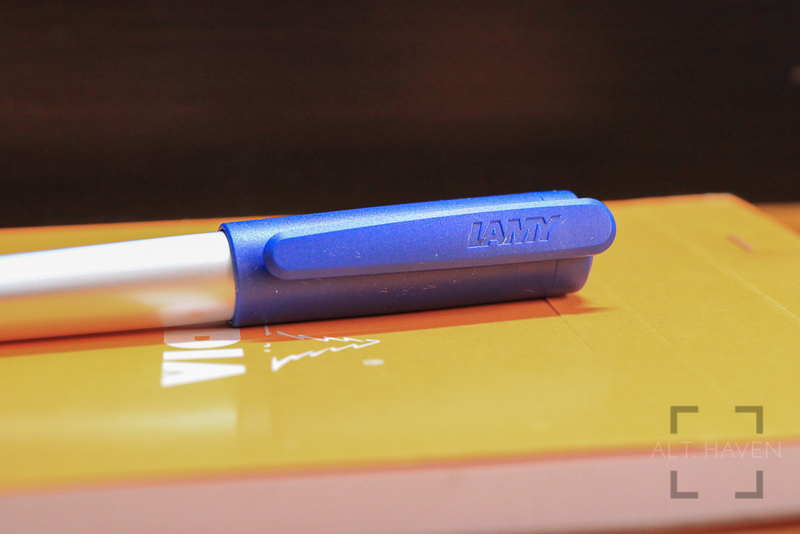 The Lamy Nexx is a worthy alternative to the Lamy Safari. It’s more rounded triangular grip makes it an easier grip to use for those who cannot get used to the Lamy Safari’s grip. 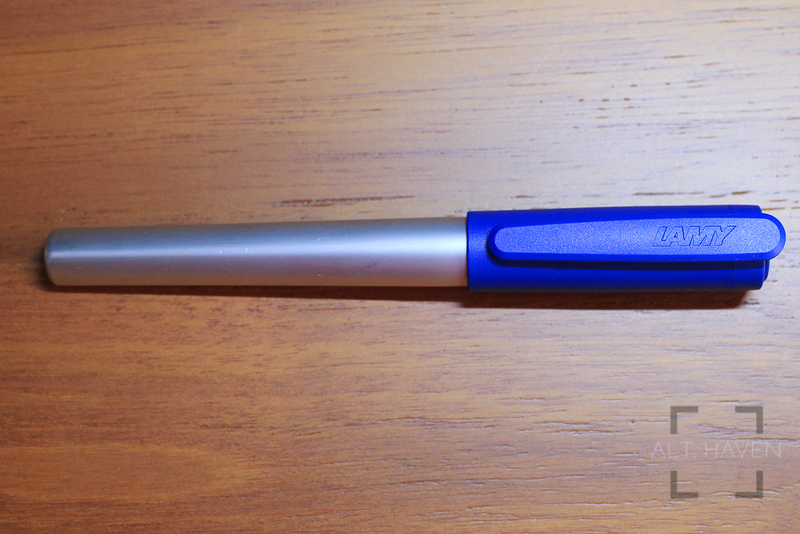 Once again, my thanks to Goldspot Pens for sending me the Lamy Nexx for review. My thanks to Goldspot Pens for sending me the Caran d’Ache 849 for review. Caran d’Ache is a Swiss manufacturer of art supplies and luxury writing instruments. Personally, it is a brand that belonged on the high end of things due to the price of their products. 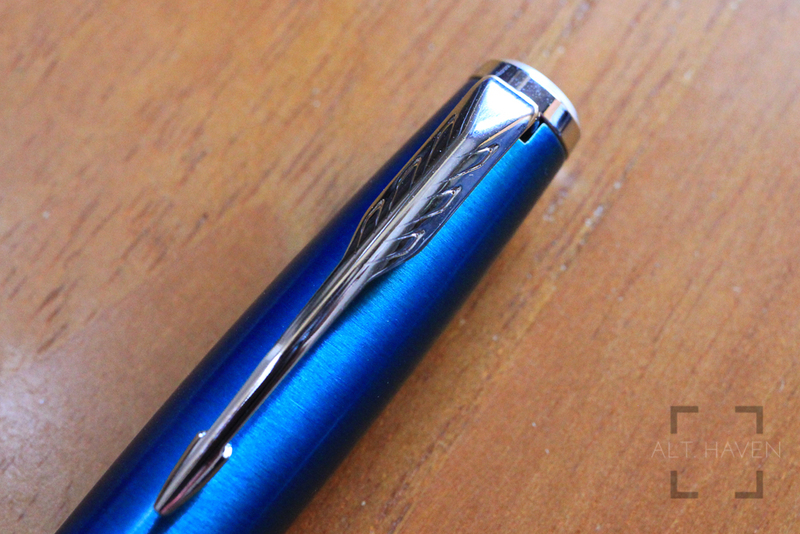 But here comes the 849, it is Caran d’Ache’s entry level fountain pen. Priced at USD$51.95, it is a lot more affordable than what Caran d’Ache is traditionally known for. The 849 comes in an eye-catching red box with the Caran d’Ache logo printed in white. Opening it you’ll find the pen inside. It’s a very simple packaging but for its price point, I am not expecting anything more than this. It is functional and it is compact, exactly what I’d prefer from packaging in general. The Caran d’Ache 849 is a slim hexagonal shaped fountain pen. Mine came in bright fluorescent yellow, or what I’d call highlighter yellow. The bright yellow is accented by a silver coloured metal clip that hugs the side of the cap. It has a polished silver coloured end and a finial. The finial has a hexagon emblem on it. The tension on the clip is of the right amount of tension. It’s not so tight you can’t lift it with a finger or so loose you’d not trust your pen to the clip. The snap cap popped open and close easily. It has a particularly satisfying snap on closing. The cap spins around on its barrel easily. It is not particularly anything inherently negative about it but personally I’d prefer that it doesn’t do that. Once the cap is off the first thing I notice is the long slim grip section. It is slimmer than anything I am used to. It is not uncomfortable per se but it does take some getting used to. I know this grip section will not be comfortable for everyone so I’d advise buyers to test before buying. There is a significant step between the barrel and grip. And I’ve noticed something about the grip especially when I let my friends and colleagues try the pen. 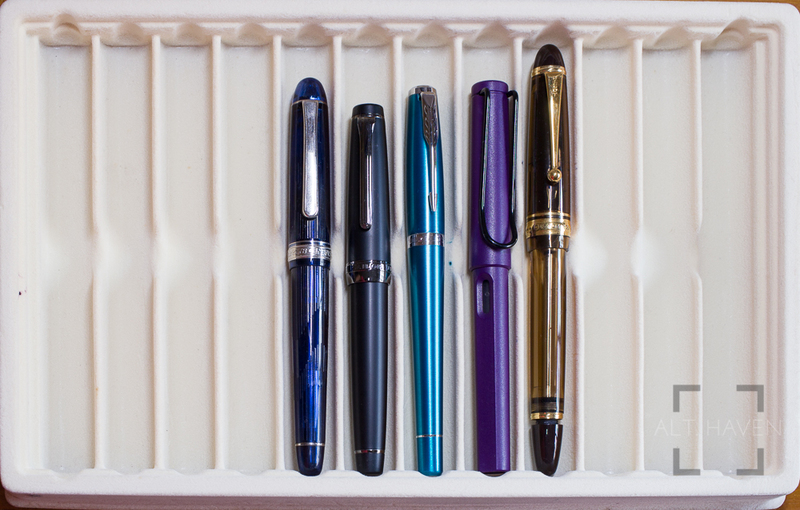 I tend to push fountain pens to my friends and colleagues to try. That way I can see what people who are not particularly stationary inclined tend to prefer. One thing I’ve noticed for the Caran d’Ache 849, people tend to consistently choose this over any other fountain pens I might have on hand. Price is not the determining factor when they try it out. Many have cited the narrow grip as one of the main factor, other than the writing experience. My theory is the narrow is very similar to the traditional Redleaf style ballpoint pens than tend to be what’s supplied in offices and purchased for school because they’re cheap. The Caran d’Ache 849 takes a standard international cartridge or converter but it doesn’t ship with a converter so I popped in one of the many standard international converter I have. The pen takes it without any problems. Now comes the nib. The Caran d’Ache 849’s stainless steel nib is tiny and leaf shaped. Even though it is small, it sort of fits the slim profile of the fountain pen. It comes in EF, F and M nib sizes. I was provided a F nib which writes wonderfully. I really enjoyed the writing experience it provides. 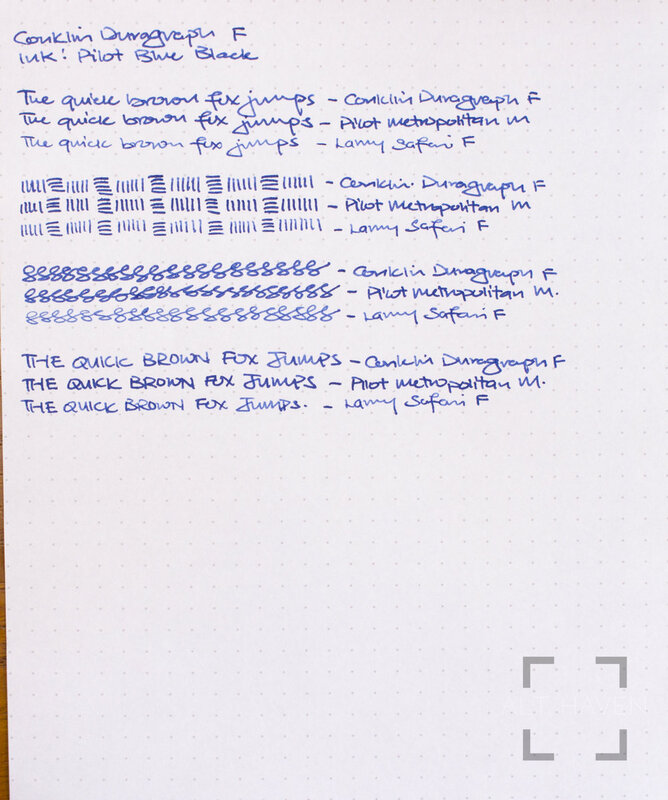 Conclusion: The Caran d’Ache 849 is an excellent introduction to Caran d’Ache pens. The slim grip is something to get used to but with the writing experience it provides it is well worth the effort to seek out a 849 to try out. 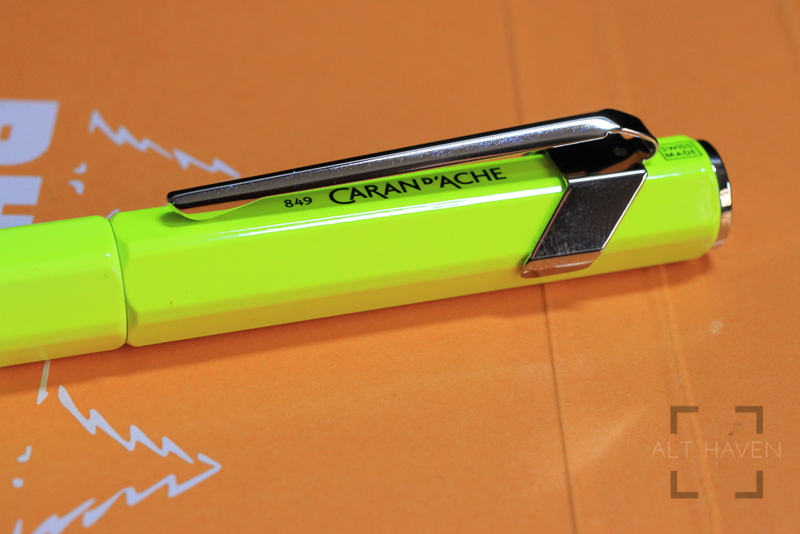 Once again, my thanks to Goldspot Pens for sending me the Caran d’Ache 849 for review. My thanks to Goldspot Pens for sending me the Conklin Duragraph for review. 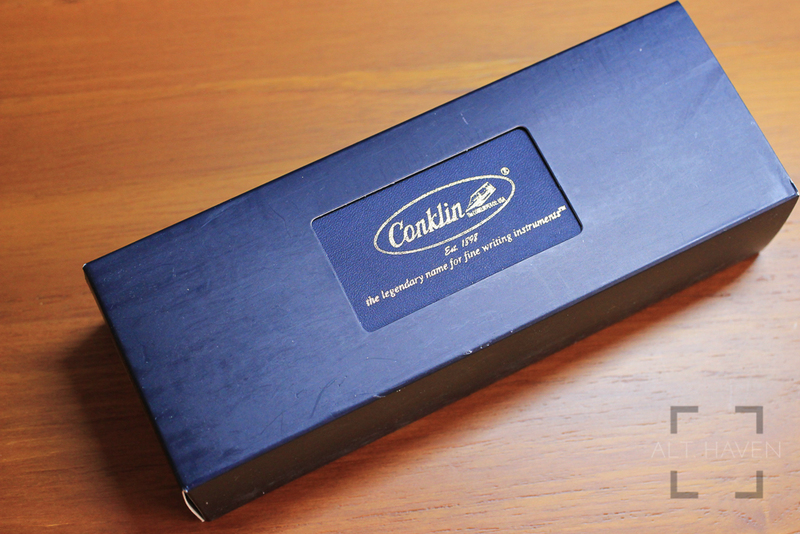 Conklin is a true blue American fountain pen maker. It’s established in 1898 and it had been the forefront of fountain pen innovation with the Crescent Filler system back in 1897. Conklin has since been purchased by Yafa Companies. The Duragraph was originally launched back in 1923. The current incarnation of the Duragraph comes in 7 colours. It’s available a variety of nib sizes namely fine, medium and stub. I was sent the Red Nights in F nib. The Conklin Duragraph came in a sturdy blue box. It is sheathed with blue cardboard sleeve with a cut out over the Conklin logo. Once the cardboard sleeve is removed, you will find a tastefully designed box. 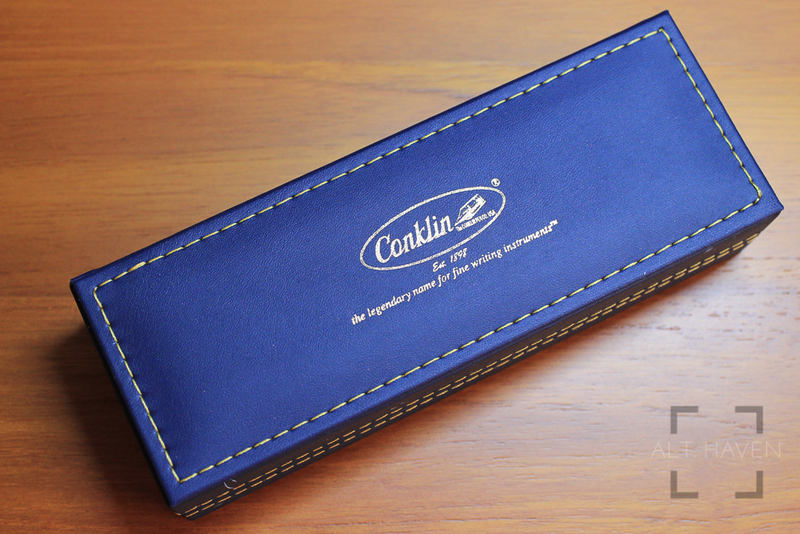 On the outside you can see the Conklin logo as well as the stitching that outlines the box. The snap top box opens easily, and the pen is lying in the middle. Overall, I really enjoyed the look and feel of the Conklin Duragraph’s packaging. I was sent the Red Nights edition of the Conklin Duragraph. It’s black on the ends with a red semi-translucent crystallised finish in the middle. A silver clip, thinner top and end rings and a thicker centre ring accented the flat ended fountain pen. It’s designed to be at home in a professional setting. The clip has a decent tension. I trust it to keep my pen secure in my pen case without problems. The centre band has the Conklin logo, crescent moons and the word “Duragraph” etched. 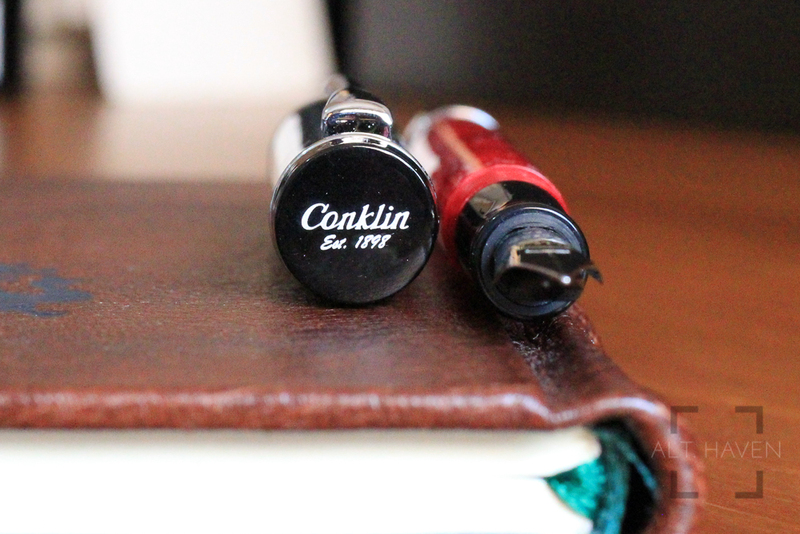 The Conklin logo is just ever slightly off centre from the clip. I am not sure if this is standard across all the pens or it’s just mine that’s slightly off centre. It’s not a big deal, but it’s these tiny attention to detail that makes a good pen a great pen. The cap takes a single full revolution to be uncapped. Once uncapped, you will see generous sized stainless steel two-toned nib. The grip section has a comfortable taper and flare towards the nib. The threads are smooth and doesn’t cut my hand. The pen itself is light and well balanced. The cap can be posted but I find it made the pen entirely back heavy. 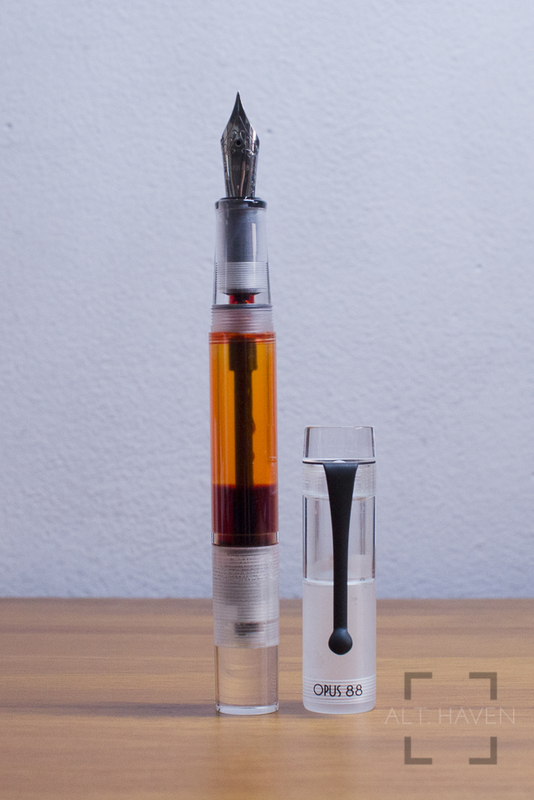 The Conklin Duragraph has a cartridge and converter filling system. The convertor provided is threaded, and it makes the converter that much more securely attached to the pen. The Conklin Duragraph that was I sent is a generous and wet F nib. It writes very smoothly but I find the F writes more like an M. However the excellent writing experience more than make up for it. The Conklin Duragraph surprised me. I was expecting a serviceable pen, but it delivers more than a serviceable experience. It has a smooth and wet nib, it’s well balanced and comes with a threaded converter. It’s an attractive looking pen for a great price. 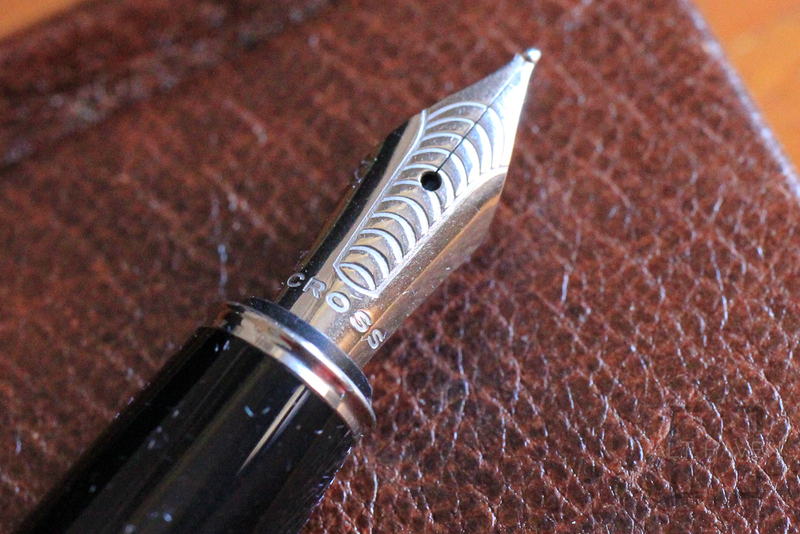 For this particular price point, the Conklin Duragraph is an impressive pen. 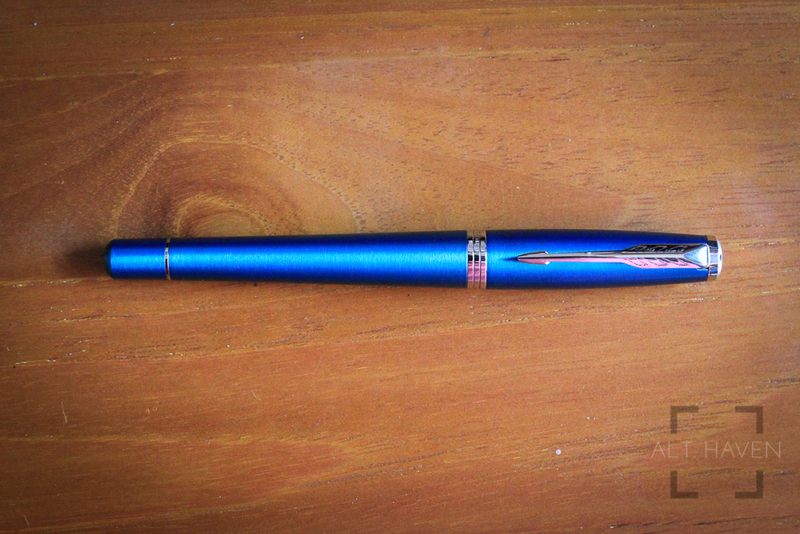 Once again, my thanks to Goldspot Pens for sending me the Conklin Duragraph for review. Remember it’s a threaded converter, don’t just yank it out! The slightly off centre “Conklin” on the centre band. Jin Gi is a Taiwanese company that specialises in making OEM / white labelled stationary since 1988. Opus 88 is their private brand. Opus 88 fountain pens had been all the rage earlier this year and when pens were available in Singapore, they were sold quickly. I was one of the lucky few who managed to get a set. My Opus 88 Koloro Demonstrator came in a simple box. It has a brown cardboard sleeve with the Opus 88 logo printed on it. Sliding it out, you will a black box underneath. Inside, is the pen and a glass eyedropper as well as a card with relevant information. 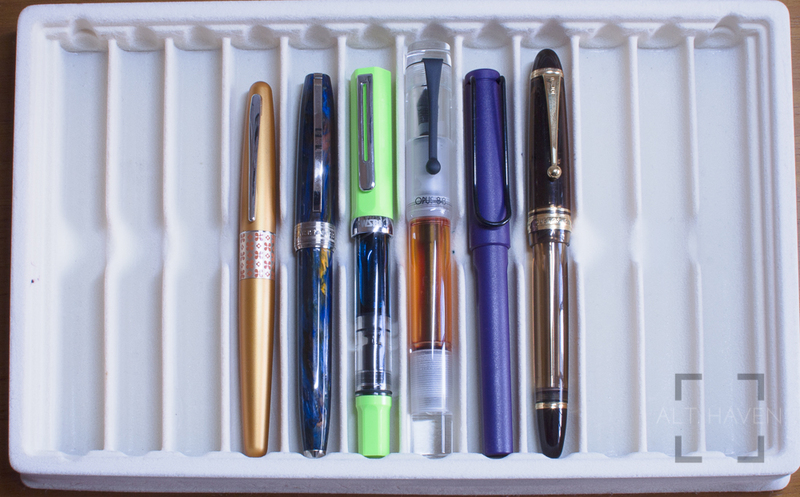 There are foam inserts that secure the pen and the glassdropper inside the box. It’s a very functional packaging for the price I paid for this. First thing right out of the gate, you will notice is the size of the pen. It is huge. I’d say it is similarly sized to the Pelikan M1000. I do not personally a Pelikan M1000 but based on the measurements I found online, the Opus 88 Koloro Demonstrator is just slightly longer than the Pelikan M1000. 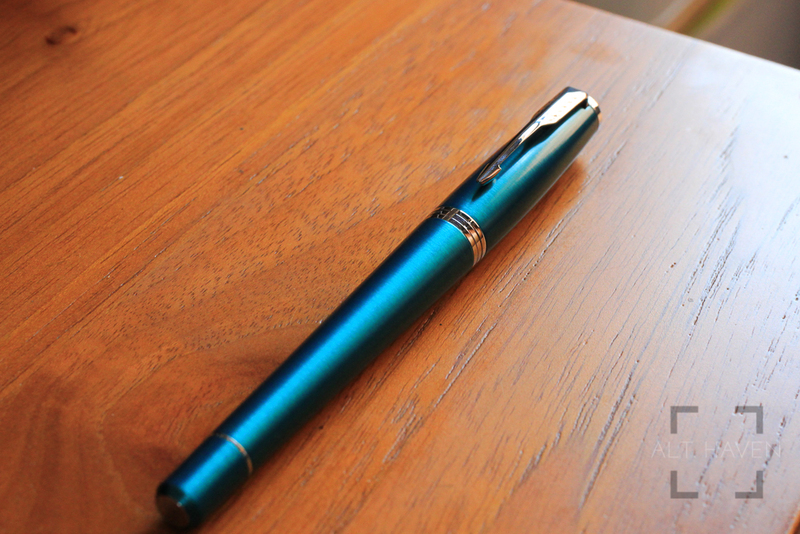 However, despite the length of the pen, the Opus 88 Koloro Demonstrator is a light pen. It is made of clear plastic accented with a matte black clip, giving it a classy look. Now a demonstrator pen just calls for a nice bright ink to show off the interior. 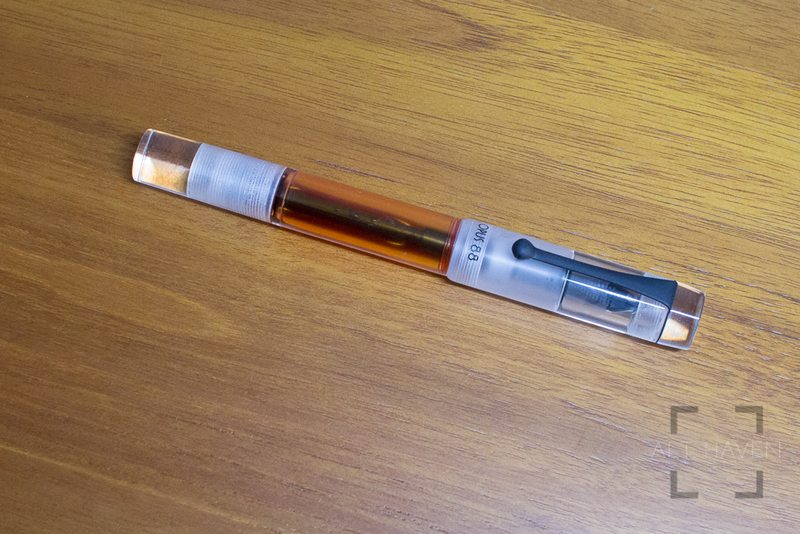 The Opus 88 Koloro Demonstrator is polished to a nice glossy finish on the exterior. The cap just slightly wider than the body. The black words “OPUS 88” printed on the cap just under the clip. It takes a full 3 revolutions to get the cap off. This isn’t something I like. 3 turns is 2 tunes too many in my book but this is just a minor pet peeve. Once the cap is off you will see a very generous space on the grip and a #6 size Jowo steel nib. The grip is smooth to the touch and tapers towards the nib, ending with a slight flare. The threads are nice and smooth. The balance of the pen tips towards the nib so it helps with keeping the nib on the paper. Since this is an eyedropper pen, to fill you have to unscrew the nib and grip and fill the pen that way. The body of the pen holds a whooping 4ml and it will last you a good long time. But this isn’t simply an eyedropper pen, it has a small seal attached to a piston mechanism to seal the ink chamber away from the feed. That makes flying with the Opus 88 Koloro Demonstrator is way safer than a regular eyedropper pen. But when you are ready to use it, unscrew the knob at the end. You just need it about 2mm of space for regular use. Then the nib, I opted for a fine nib which in hindsight is a bad choice. The steel nib writes ok, nothing special but it is dry, very dry. And pairing a dry fine nib with a 4ml ink chamber seems like a bad idea after I’ve used it for a while. Now, comes the cleaning. I don’t usually cover cleaning but this pen has frustrated me with keeping it clean. This is a demonstrator pen so the hope is I’d use inks that do not stain. I’ve filled it with Sailor Nioi Sumire and before that Monteverde Moonstone. Both of them stained to a certain degree and it wasn’t easy to get all the ink out even though it is an eyedropper pen. There is ink clinging to the inside of the pen barrel and cap for no reason I can figure out. Washing it with an ultrasonic cleaner helped some but there are still ink stains that just won’t go. The stains only got removed by soaking it in pen flush. The pen flush worked like a miracle but I don’t want to resort to a pen flush to clean this pen every single time. Overall the Opus 88 Koloro Demonstrator is a value for money fountainpen but the pen is just not for me. The larger size doesn’t fit my hand well, the nib coupled with the large ink capacity is also not working well for me. The nail in the coffin for me is how hard it is to keep the pen stain free. The pen is entirely serviceable but it is just not for me. There are affiliate links in this review. I may get a small amount of store credit if you purchase anything via the links. You are under no obligation to do so but if you would like to do something nice, do buy what you need via my links.